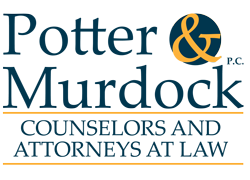 LABOR AND EMPLOYMENT - Potter & Murdock, P.C. Advice and Counsel: Advising employers on personnel practices and employee relations matters, including discrimination and harassment issues, layoffs, disability and religious accommodation issues, interpreting and applying employment policies and legal requirements for specific personnel decisions, conducting and supervising internal investigations, counseling on appropriate actions to minimize risk of liability, and negotiating and preparing employment contracts and separation agreements. We also prepare and enforce non-disclosure, trade secret, non-solicitation, and non-compete agreements. Employment Litigation and Investigations: Defending employers in federal and state court and before regulatory agencies in matters involving wrongful discharge, harassment, discrimination, contract, tort, ERISA plan subscriber and participant claims. Employment Policies and Handbooks: Preparing and reviewing employment policies and employee handbooks, including review of particular policies prepared by clients to complete preparation of employee handbooks tailored to the needs of individual employers, as well as compliance with Americans with Disabilities Act requirements. Management Training: Providing training programs for managers and supervisors on performance management and termination, performance appraisal and evaluation, workplace harassment and discrimination, time and attendance, non-discriminatory employment practices, and interviewing and hiring. Employment Discrimination: Working with clients to develop policies and practices to prevent employment discrimination and harassment and to strengthen clients’ defenses against claims of employment discrimination and harassment. Wage and Hour Matters: Providing ongoing advice, policy reviews and other services related to wage and hour issues, including defending claims arising under the Fair Labor Standards Act, Davis Bacon Act, Walsh-Healey Act, Service Contract Act and other federal and state wage and hour laws and regulations. Unemployment Benefits: Representing employers in planning personnel actions to minimize unemployment taxes and assessments and in defending claims for benefits in administrative proceedings and court appeals.